We are delighted to announce a new capability in Microsoft Video Indexer: Brand Detection from speech and from visual text! If you are not yet familiar with Video Indexer, you may want to take a look at a few examples on our portal. Having brands in the video index gives you insights on names of products and organizations, which appear in a video or audio asset without having to watch it. Particularly, it enables you to search over large amounts of video and audio. Customers find Brand Detection useful in a wide variety of business scenarios such as contents archive and discovery, contextual advertising, social media analysis, retail compete analysis and many more. Let us take a look at an example. In this Microsoft Build 2017 Day 2 presentation, the brand "Microsoft Windows" appears multiple times. Sometimes in the transcript, sometimes as visual text and never as verbatim. Video Indexer detects with high precision that a term is indeed brand based on the context, covering over 90k brands out of the box, and constantly updating. At 02:25, Video Indexer detects the brand from speech and then again at 02:40 from visual text, which is part of the windows logo. Talking about windows in the context of construction will not detect the word "Windows" as a brand, and same for Box, Apple, Fox, etc., based on advanced Machine Learning algorithms that know how to disambiguate from context. Brand Detection works for all our supported languages. Click here for full Microsoft Build 2017 Day 2 keynote video and index. We have already got mining algorithms in place, which mine brands and will be updating the brand base regularly. However, we also allow customization of brands which includes adding and excluding brands from the index. The following screenshot shows the brand customization screen. You can reach it from the customization button on the upper-right corner of the VI portal main page. 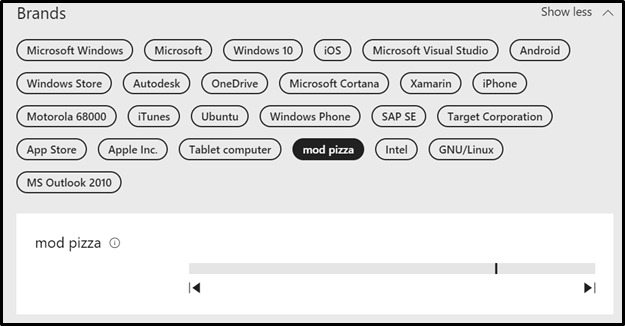 Let us add 'Mod Pizza' as a brand to be included. Click here for full Microsoft Build 2017 Day 2 Keynote video and customized index. 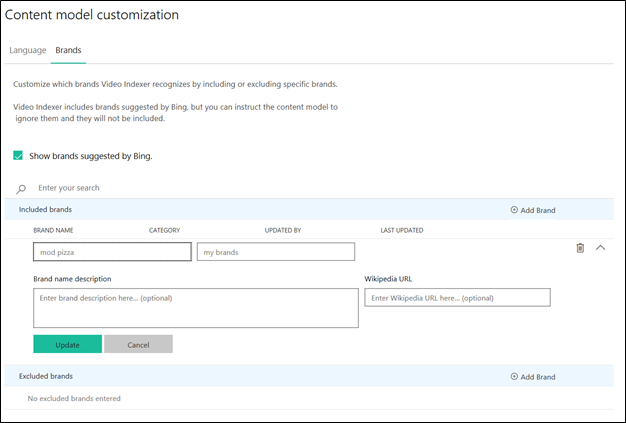 In the Api Partner Customization Brands Web API you will be able to customize brand detection. You can enable and disable the detection of out of the box brands, as well as add your own custom brands for VI to detect or ignore. To add your own brand for detection or filtering, all you need is the brand name. It is recommended to add its Wikipedia page as well if possible for improved results. You can also specify to which categories the brand belongs. From that moment forward, every video that is indexed, will account for your customization. Brand Detection is a new capability in Video Indexer, which enables you to index brand mentions in speech and visual text, based on a large built-in brands catalog as well as with customization. Brands are disambiguated from other terms using context. Please visit our API documentation on the VI developer portal, for more details on how to use brand detection in VI.